The five day festival is synonymous with the lighting of colored lights, candles and lamps. 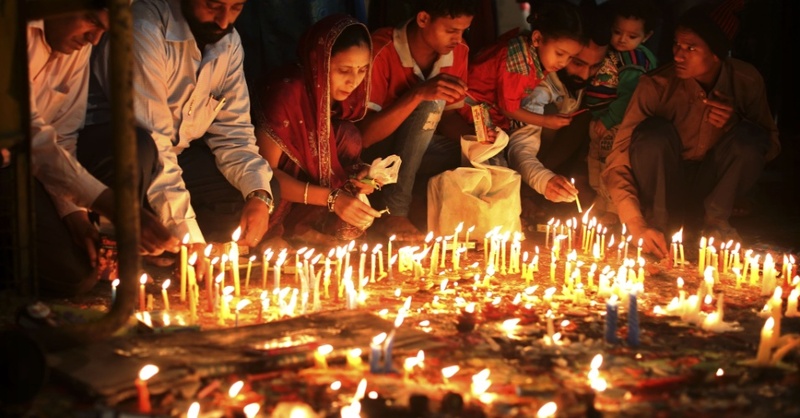 This year, less than half of Hindus devotees will be able to light up the evening. The supply of energy from India fell by over 90%. The population now forced to eat raw foods. Hindu faithful: "it no longer makes sense to celebrate because there is no joy. People are living in darkness and uncertainty". Kathmandu (AsiaNews) - The feast of Diwali, one of the most famous in Hinduism, is likely to be celebrated in the dark this year in Nepal. The festival that began yesterday lasts five days, typically transformed by the light of colored candles, lamps and lights, but the country has no energy, because the trucks that transport fuel from India are stuck at the border between the two states . India’s unofficial trade embargo against Nepal has reduced the supply of gas and fuel by more than 90%. Fr. Ignatius, pastor of the Assumption Cathedral, told AsiaNews: "The crisis is endangering everyone’s lives. But today it is especially affecting the Hindu holidays, because there is not enough electricity for lights. We pray for an immediate solution, which must pass through mutual dialogue among the leaders”. The celebration of Diwali is also known as Deepawali. During the festival millions of lamps are illuminated in India and Nepal, representing the victory of truth over untruth, light over darkness, of life over death, of good over evil. The festival also marks the beginning of a new year, family reconciliation, especially between brothers and sisters, and adoration of God. For more than 50 days Nepal has been suffering a severe shortage of goods and services, after India blocked goods following the promulgation of the nation’s first secular and democratic constitution. The population is suffering from severe food shortages and the lack of cooking gas. This lack is even more acute for the effects of the devastating earthquake in April. The authorities in Kathmandu appealed to the international community for help for what is likely to become a "humanitarian catastrophe" and are trying to open trade routes alternatives with China and Bangladesh. This year less than 50% of Hindus celebrate the festival of Diwali, which could aggravate the condition even more social harmony, already strained by clashes between minorities. The country, one of the leading producers of hydroelectric power thanks to the rivers that flow in the Himalayas, does not have the appropriate facilities for its production and is forced to import energy (and fuel) from abroad. The shortage of electricity supply causes power cuts that last as long as 18 hours a day. Govinda Tondon, administrator of the Hindu temple of Pashupatinath in the capital, said: "There is no joy, we have nothing to celebrate. People are still living in temporary shelters because their homes have not been rebuilt after the earthquake. Now they do not even have oil and gas for cooking and have begun to eat raw foods". The population, he concludes, "is living in darkness and uncertainty about the future. The festival of light has lost its original meaning.